You might not know it but the modern internet is 25 years old today! It started life as an idea in a paper written by a young computer scientist named Tim Berners-Lee in a rather obscure laboratory in Europe known as CERN. At first his idea wasn’t exactly taken on enthusiastically by his colleagues with his manager being non-committal stating it was “vague but exciting”. Of course the American military had their Arpanet in 1969 but its purpose was entirely the opposite of the proposed World Wide Web. It was designed to be used my remote servers and computers all over the world, on different operating systems and free to all with no censorship of ideas. 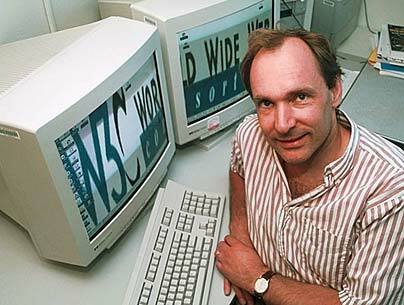 Sir Tim Berners-Lee, the inventor of the Web who gave away his invention for free for the betterment of mankind. There were already existing online services such as Minitel or Compuserve but they were paid for services whilst many others such as myself used local Bulletin Board Systems or BBS which were like text-based individual websites that you could send “email” through using Fidonet though it could take a day or two to arrive. There was also the competing Gopher system and with other alternatives to the Web being centrally controlled but with finances behind them, it wasn’t immediately obvious that the Web would triumph. I remember going on the internet for the first time probably around 1991, chatting excitedly about the new Star Trek 6 movie. Yes the internet of that time was primarily for scientists, engineers and geeks and whilst todays is a lot bigger and easier to use, I must admit in some ways I enjoyed it more back then. It was sort of like a secret club full of interesting finds. Unregulated, untested and a mystery even to many nerds. One of the first things I did was use Gopher and FTP to access satellite images from NASA and other scientific bodies. I had paid £300 for newest 14,400 bps modem which only took a few minutes to download a black and white picture so long as no-one picked the phone up downstairs. Then there was that nervous wait for the phone bill to arrive. How could getting photos and messages from America, Australia or Japan be a local call and far cheaper than dialing across London? I told my parents it would be okay, they weren’t convinced and I had my fingers crossed! Websites started to appear like the famous page which simply had a red circle on it and nothing more. People would still find the page “wow a real red circle that isn’t even stored on my computer”. Things began changing in the late 1990’s. The first big organisations started making really useless websites that were only good for sampling a few products before going to buy the physical item elsewhere. Many didn’t bother updating their sites for months or even years on end. Politicians began to get worked up about the internet. They didn’t understand it, they had never seen or used it but because a tabloid paper picked up on the fact that a career criminal had dodgy photos on them or were talking about risqué things then surely this internet was dangerous and uncivilised. Why would anyone want to go on it? It should be banned! As with anything that people don’t understand or use, they try to regulate it and take away the liveliness that made it such a great place in the first place. Money moved in, software upgraded to allow intrusive adverts and millions of people connected for the first time every day but something was lost too. Now we all suffer from spam, advertising and money-making scams unless you install extra software or have really basic software. Those adverts can’t pop up if you don’t have pop-up software! More and more the internet is being controlled by governments mostly but also by big business who spend a fortune to try to sway our thinking and influence our spending decisions. Many countries ban several websites or even block the entire internet whilst many democratic countries routinely spy on our emails and habits and want the power to do more. Today Sir Tim Berners-Lee, the daddy of the internet is asking that a digital Magna-Carta is drawn up to safeguard out freedom and privacy. The Web We Want Movement is working to stop new and intrusive laws coming in across the world, taking away our rights and privacy that some of us have been enjoying for 25 years now. The NSA in the United States spies on people on an unprovoked scale on people around the world, even on 100% reliable and peaceful allies in Europe with its citizens being snooped on. There may be laws for the NSA not to spy on American citizens but don’t worry GCHQ on Cheltenham, UK spies on American citizens so that both nations can claim not to monitor their own people whilst knowing exactly what is going on. They don’t see any problem with it, they’re just upset that they got caught. Personally, I don’t even want my government spying on me let alone the American government. If I wanted people in London or Washington to follow my every move then I would install cameras all around the house for them to get a better view. Many say that we are being protected for our own good but I don’t agree. Much like the mysterious war on terror, I don’t need or want my personal rights and freedoms to disappear because of possible Muslim terrorists and I did quite well going through the London streets to college every day while actual IRA bombs were going off but now there is an air of fear and control. If terrorists real or suspected are found in Pakistan or Yemen, arrest them and put them on trial instead of targeting them in extra-judicial killings. If individual protesters in London protest against a government policy have committed crime then arrest them instead of using the police to “kettle” thousands of innocents inside secure zones for hours on end denying them their basic rights. Whenever new laws are brought in for reasons of war or terror or underhand espionage even if for good reason, they very quickly end up being used for reasons that we were promised they wouldn’t be. Our own governments don’t trust us and the big businesses only want to make us feel free so they can take the only thing of value to them, our money. Some would say if you have nothing to hide then you have nothing to worry about. I don’t have anything to hide when eating, but I prefer to eat in private. I don’t have anything to hide when walking but I prefer to walk in the country instead of the busy streets with all its spy cameras. People don’t have anything to hide about anything any more but few decide to walk around naked in the street. It’s called having dignity, self-respect and privacy and it should be the same whether we are in out own house, in a public space or engaging in free and private business on the internet. The free internet allows us the people to talk, to listen and to decide ourselves if someone or something is crazy or bad. We as writers no longer have to depend on the commercial interests or even political interests of others to publish on-line. We can do it every-day here on WordPress and 100 other forums and we can self-publish our books without the permission of others. Sir Tim Berners-Lee believes that a freer and more open internet will foster changes in social and political structures, and make them better suited for the Internet age. He spoke about the need to re-examine some cyber-related laws from the point of view of users and not corporations, such as copyright laws, which heavily penalise users of the Internet for availing of content freely available online. As more and more of our daily lives take place over the internet then it becomes more and more important we stand up for ourselves and not less those with their own interests at heart tell us how and how not we can communicate or what we can view on-line. This entry was posted in Politics, Science and Engineering and tagged GCHQ, Internet, Kettling, Life, News, NSA, Online Surviellance, Opinion, Politics, Sir Tim Berners-Lee, The Magna Carta, War on Terror, Web We Want, World Wide Web. Bookmark the permalink. I completely agree with you, freedoms are being lost everyday, maybe the web will change things for the better if it remains free, but unfortunately I don’t hold out much hope. Thanks Colin. It does seem unlikely, even democratic governments hardly ever grant new rights or strengthen existing rights of the people. It’s all about subjugation and curtailment under the guises that it is in our best interests when really it is only in the interests of the state. Such an interesting article Stephen, and being in Australia with our current tyrannical government it is particularly pertinent. Thank-you. Yes I have heard all sorts about what is going on in Australia the last year or two. At least the Chinese don’t pretend they liberal. It is quite scary and it is getting worse! I am not really sure what we, just regular people, can do about it. I’ve re-blogged this article. Lots of your ideas are also in the book by Jonathan Porritt – The World we made – Alex Mckay’s Story from 2050…It is a great read….set in 2050 and looking back at what has happened in the last few decades. There is a great chapter entitled ‘Internet Wars’. It looks at concepts like mind shares and net neutrality. Have you read it? Thanks for the re-blog and your comments. I haven’t read that book but I have just ordered it so I will let you know what I think later. Great. I have found it thought-provoking and I am thinking about how I could blog on the issues raised.